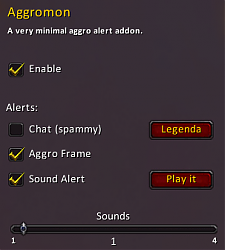 It simply plays a sound and/or prints in the default chat frame and/or show a frame colored based on unit aggro. The options can be turned on/off indipendently each others. and restart with a fresh config. - added the option to enable/disable in PVP zone. Thank you for making this addon! I miss Banzai Alert, too. May I request an option to make it work only in instances, and only when not specced as tank? Don't need to know I have aggro when I'm solo questing. I'll check your ideas and I'll try to implement it if I am able to do. Last edited by Telarian : 11-07-14 at 08:37 AM. The name is great actually! 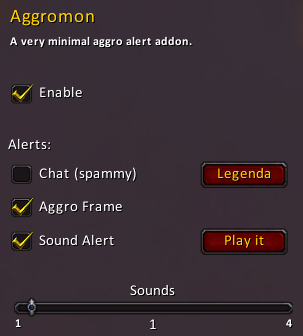 Thanks for the addon!